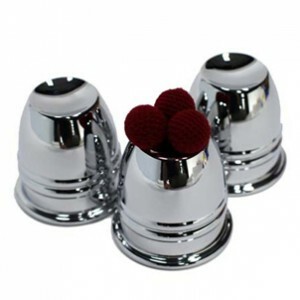 These are the most demanded Cups & Balls by the professional magicians: Heavy chrome plated and with a heavy feel. This set of 3 cups weighs more than a full pound. The cups stack perfectly & the balls rest 3 on the cup’s top perfectly. Each cup stands 3.75 inch with a 2.5 inch cup opening. Includes: 3 Chrome Cups and magic knit balls.